Composer, pianist and performer of experimental electronic music Simon Vincent is known for his unconventional music projects. One calls to mind, among others, releases by the eccentric duo Charlotte & Mr.Stone and The Occasional Trio’s great album “Opening Lines” (2015), featuring Roland Fidezius and Rudi Fischerlehner. With this second CD published by Vision Of Sound, Simon Vincent returns to experimental music with a smooth and supple minimalism, unearthing the opportunities afforded of improvised electronic sound processing in real time. His partner in the project “Real-Time Sound Sculpture” has been compared by critics to the famous Kenny Wheeler. Trumpeter Tom Arthurs is fascinated by contemporary classical music, and is perhaps best known for his excellent duet album “Postcards From Pushkin “(2011) recorded with pianist Richard Fairhurst, as well as for projects with Eric Schaefer and Sven Bergmann. 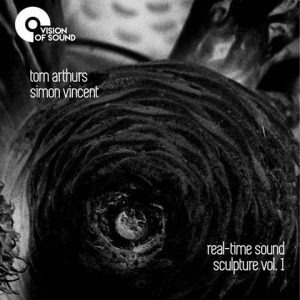 The album “Real-Time Sound Sculpture Vol.1” includes material recorded in March 2015 in the Paul Gerhardt Church in Berlin, and is the result of the artists’ mutual inspiration. A fantastical fusion, the individual experiences they bring to the project result in an unusual music which escapes any categorization. Both artists employ a variety of sound effects and with the use of long pauses, their music creates a unique atmosphere. Silence seems to be an additional instrument that creates an very special form of communication. It is music that can not be clearly classified. It is also important to listen intently to the sounds coming from the loudspeakers. Only then you can you perceive the extraordinary magic of the sounds generated by the electronics and trumpet on this album. One senses the total commitment to this release, undoubtedly enhanced by Brtitt Hatzius’ extraordinary photographs which illustrate both the cover and booklet. This is an album by the British Improvising Music duo comprised of trumpeter / composer Tom Arthurs and Simon Vincent, who generates electronic sounds. The music was recorded in real-time in a Berlin church and is completely improvised and presented on this album as two separate pieces, the first of which is divided into two and the second into three tracks. The music is almost completely detached from the basic elements of melody, harmony or rhythm, and ventures into the abstract exploration of sound. As such it can only be absorbed on a pure emotional level, which naturally depends on the listener’s frame of mind at the time of listening to the music. There are long passages of almost complete silence or very low volume level of electronically generated sounds, which repeatedly test the listener’s patience. Arthurs’ contributions are of course, as always, aesthetically overwhelming and the sound sculptures the musicians create together are fascinating, even though they are extremely challenging. This extreme avant-garde minimalism and free spirited sound creation is therefore definitely for the average listener. Nevertheless this is definitely a valid form of musical cooperation and artistic expression, and open-minded listeners who are not afraid of experimentation should find this unique album intriguing and demanding, which is more than one can say about most of the music created these days. Some time ago we reviewed ‘Opening Lines’ by Simon Vincent’s The Occasional Trio, which was an intelligent work for bass, drums and piano. With this new release we learn about a totally different side of Vincent’s musicianship. The descriptive title gives an important clue of what their work is about. But let me introduce Tom Arthurs first. He is a gifted trumpet player who runs two trios, both with an international line up. He shared the stage with uncountable jazz and improvising musicians, and is documented on many CDs. Instead of piano, Vincent now plays live electronics. Their collaboration started in 1999 and over the years their work was shaped and developed. In 2010 they debuted with an EP on the London-based Not Applicable label. Combining trumpet and electronics in a live setting is what they are researching. The results are extended sound textures for trumpet and electronics. They are not into big, expressive gestures and movements, although there are some very dramatic episodes like in ‘Part 2’. They seek for detail and nuance on a micro- level.